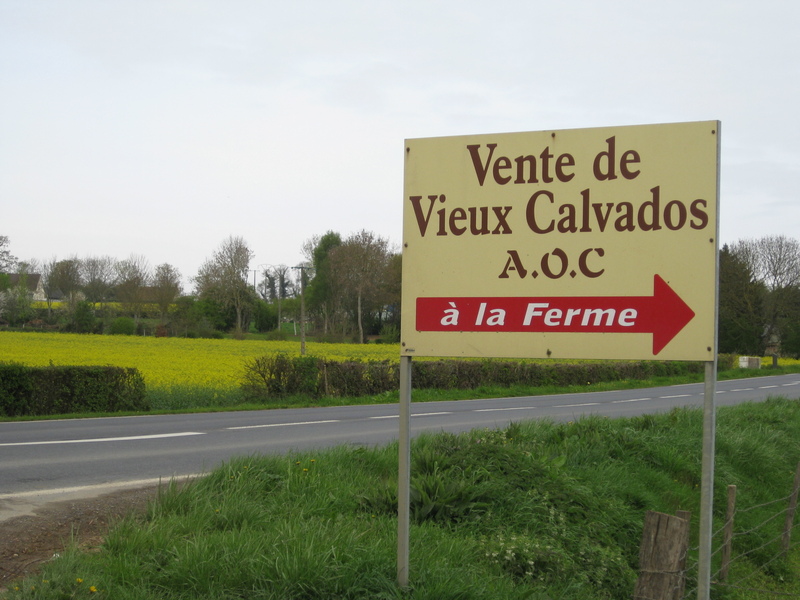 A Calvados by any other name…. To anyone following the saga, our little bottle of distilled apple happiness made it to Ohio. To celebrate, we finally cracked open our liquid lovelies and sampled side-by-side: the Calvados we procured on Ernie’s quest, an apple eau de vie from Brittany (a “calvados” that can’t be called calvados because it wasn’t made IN calvados…it would have to be called “Côtes d’Armor” which, while poetic, sounds like something that would include vanilla, strawberries and honey…*), Oregon’s Clear Creek Distillery eau de vie, and to mix things up, Laird’s applejack. Not to be all francophile, but the U.S. contestants were so far in the basement we didn’t want to sip them with a ten-foot straw. As a cocktail mixer, if the somewhat caramel / vanilla flavor of the Applejack doesn’t interfere, we actually preferred its taste…not to mention price…over the Clear Creek offering. But did we LIKE the two bottles we’d schlepped (and when I say “we” I mean K) back from France? Both bought at small farms with hand-written signs pointing up their driveways? I mean, oh enfer oui. They were very different but both delicious. 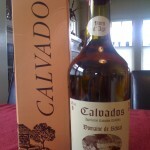 The “Quest Calvados” has a darker color and quintessential Calvados nose of apple and brandy, with a hotter finish. 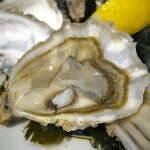 The “Fine Bretagne” has an amazing apple nose, and is completely smooth going down. Though not sweet, it has an aspect of sweetness on the tongue. 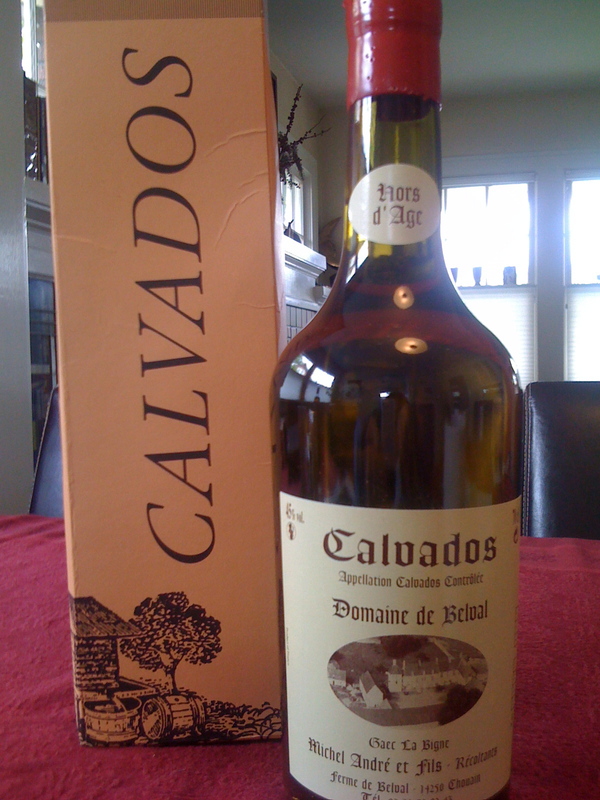 While both are excellent for sipping, only the heat of the true Calvados would suffice for a trou Normand. 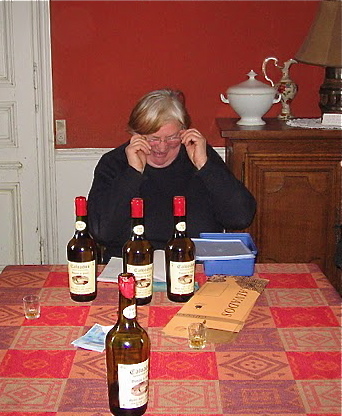 K, the traditionalist, preferred the Calvados. bb, the diplomat, wouldn’t declare a favorite, b2 held off on a pronouncement…I suspect so that he’d have to come back to try them again. 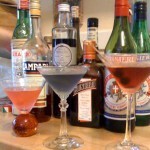 And wishy-washy me didn’t have a favorite: different drinks for different moods. To do a true scientific test, we’d need to buy a few Calvados’ of different ages (I thought the quest bottle was an eight-year-old, but it’s hors d’age, which Wikipedia tells me means aged at least six-years), and a few bottles of Fine Bretagne, to see if the differences are truly regional or just age, distiller style, barrel wood, etc. 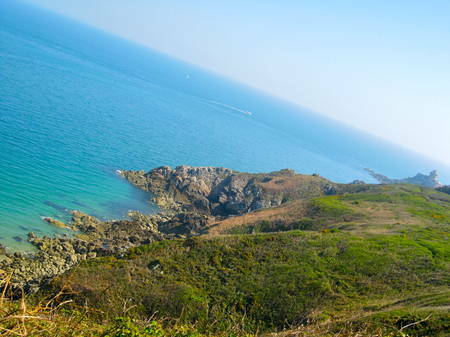 *Côtes-d’Armor, a department (like a county) in Brittany, has nothing to do with love nor armor. 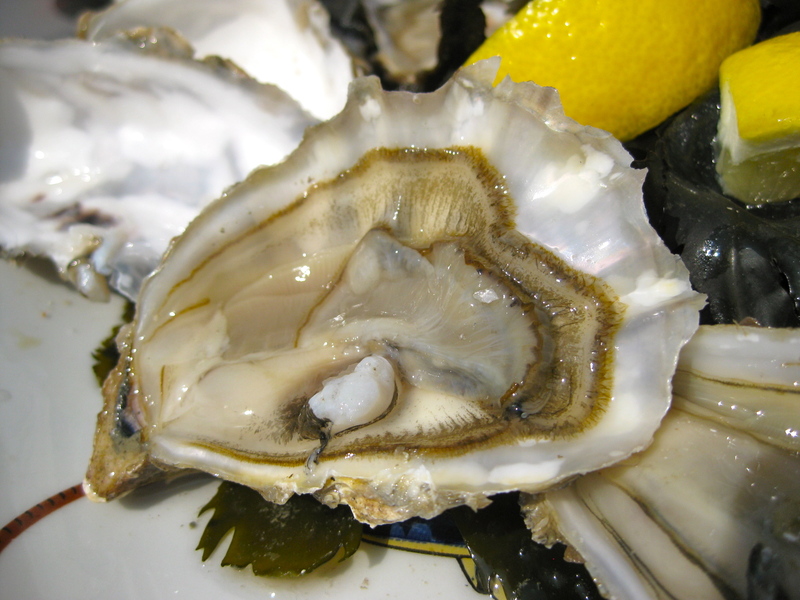 It’s derived from ar mor, which means “the sea” in breton. Makes sense. 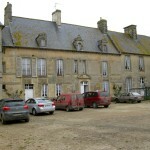 Here’s a shot from our walk less than ten minutes from where we bought the Fine Bretagne apple eau de vie. As I write, a small lonely bottle of Calvados sloshes its way cross country in the back of a UPS truck. Will it make it intact? Will rough treatment do it in? Will its liquid state make it suspect, leading to its destruction at the hands of the ATF or homeland security, hauled away on the last leg of its long journey? Plucked from an apple orchard in the brilliant green and yellow Norman countryside where it was grown, distilled, and aged to eight years, it made the journey to Paris with a few of its brothers in the back of a rental car. Wrapped tenderly in dirty socks, scarves and coats cast off in the early spring heat, it was gently nestled into luggage, dragged across cobbles to the #68 Clichy bus, to l’Opera and the Roissybus, to CDG and into the hands of uncaring baggage handlers, into Iceland, over the pole, and landing in the Pacific Northwest to become a US citizen. One bottle stayed in the rainy NW, while the other still has 2,400 miles to travel, over mountains, across prairies, past cornfields…into the open arms of its adoring new papa. How did this intercontinental adoption story start? As with all great love stories of the 21st century, it began with the internet. 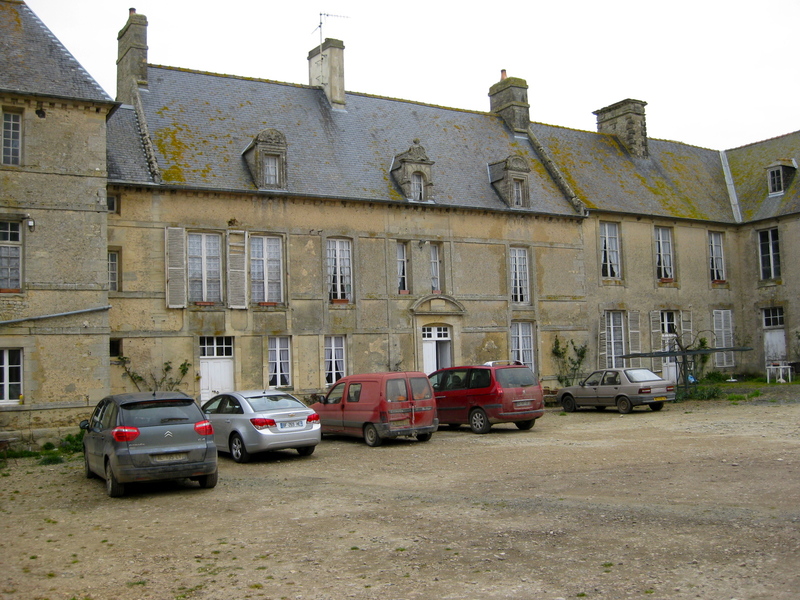 There is a farmhouse (dds note: more like an impossibly ramshackle chateau) outside of Bayeux where I bought a bottle of Calvados some time ago. I am now down to my last glass and I am in desperate need. I know precisely where the farm is but I am unable to contact the owner as he speaks no English. For anyone traveling there from the States, please help me procure another few bottles. If you are interested or able to help, I will happily furnish you with the requisite info and capital. If you are unfamiliar with the area, I can also provide you with some favorite places in the area and meals that I enjoyed. Calvados is already on the agenda, maybe I can help. 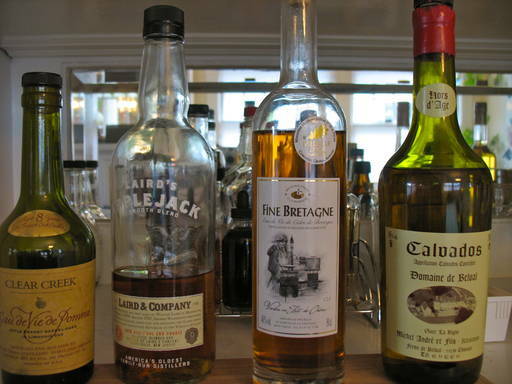 I fell in love with Calvados as a college freshmen in a basement restaurant in Les Halles—I even remember the glassware: tiny white ceramic cups, akin to a thimble-sized sake set. “Down the hatch!” says Dad, “To burn a hole and make way for the rest of meal.” It was smooth and appley, and the taste coupled with the surprise and ceremony of this fiery amuse bouche cemented the Trou Normand in my memory and affections. This was 1981, and let me tell you, Calvados was cheap back then. Maybe it was the franc-to-dollar rate, maybe it was more commonly produced, maybe we were drinking younger stuff, but even back in the States I remember being able to buy it for the price of a mediocre brandy. 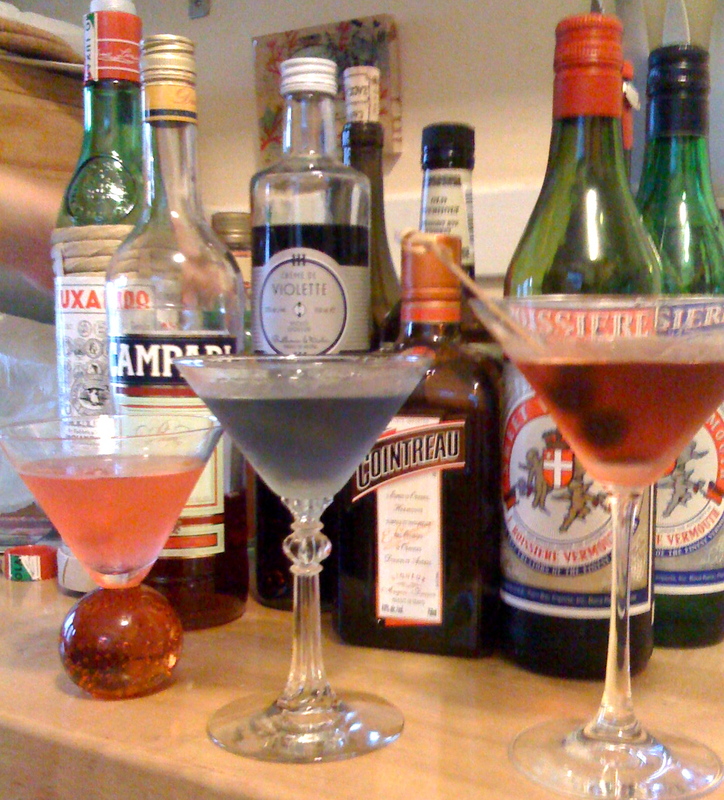 Fast-forward 30 years and our classic cocktail habit (see Dr. Cocktail, see Boozehound) had us scouring Oregon liquor store shelves for Calvados again, only to find $70 French stuff and more affordable but not-quite-right Clear Creek Distillery apple eau de vie (sorry guys, I respect what you’re doing but you still have a ways to go, imho) made right in our own back yard. So of course, E. Diamond’s request caught my eye. You’re right Ernie, we never would have been brave enough to get out of the car if not for your instructions. Ramshackle, deserted, and save for THE sign, no sign of Calvados. 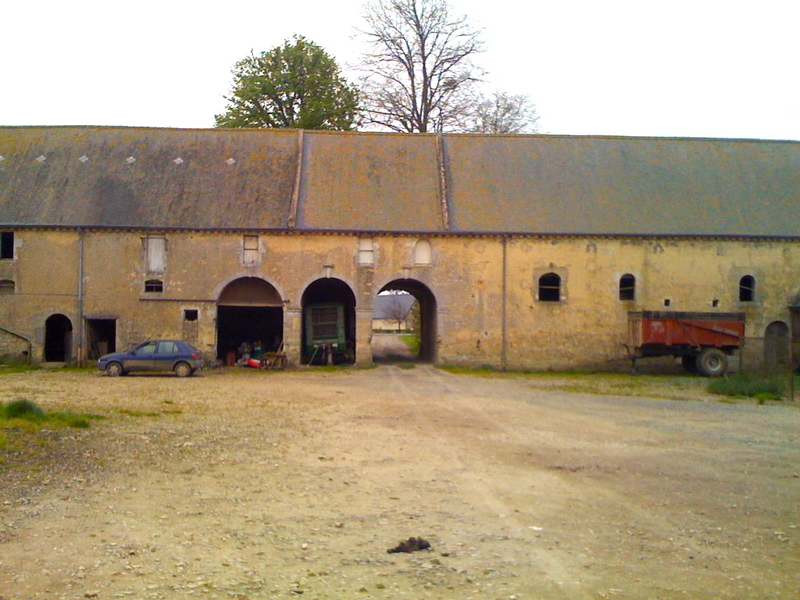 But then the door opened, a sweet old dog trotted out, followed by a woman in her rubber boots, motioning us in while she changed into her slippers, and the 10 a.m. Calvados tasting ensued. It was everything I remembered and everything our local apple eau de vie is not, though with the weak dollar, it also wasn’t cheap at 30 euro a pop. 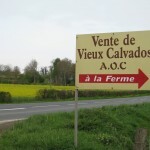 In non-existent French my sister and I tried to convey the story of who and what brought us to her doorstep: food obsessions, a complete stranger seven states away, Chowhound, Google satellite…. Lord only knows what she understood, though the internet made it through the translation somewhere (her children use the internet, but not them, oh heavens not them). Et voila, the deed was done, handshakes were made, did we want more to drink?, and back out into the light we stumbled. Adventure complete, a fun form to our French wanderings, and now all that’s left is to wait patiently to see if the-little-bottle-that-could finishes its journey intact. Ernie, let me know when it arrives, and we can raise a glass simultaneously on nearly opposite ends of the country. 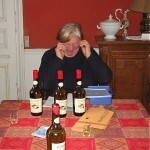 Maybe the old dog at the Calvados farm will prick up his ears, and Mme. and Mssr. 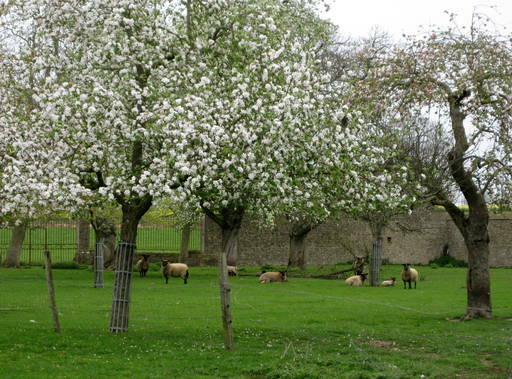 Calvados will grow restless in their sleep, dreaming of strolling in an American apple orchard. For obvious reasons, sales of pricier wines have suffered over the past year. For many, it makes no economic sense to spend the money bottling new juice that will simply end up being severely undervalued. * With the harvest coming up, the rubber’s hit the road and wineries are being told to clear out their stored juice from, where else? Charles Shaw. With its millions of gallons of storage (oak barrels and stainless tanks) and massive bottling plants, Fred Franzia’s Bronco Wines operation (aka Charles Shaw) is once again in the catbird seat, buying up juice for pennies on the dollar. The good news for us is that this $15 to $20 wine-worthy-juice will soon become Three Buck Chuck. For some, no number of “really’s” before “good” can make a $3 Chuck good enough. It’ll always be swill and you’d rather stick with a reliable $15 Cotes du Rhone. I get that. But I’ll also be picking up periodic cabs and merlots (I don’t know if this affects all varietals or one in particular) along with my milk, yogurt and tunafish, especially after the “2008″ on the label switches to “2009″. If it’s swill, the bottles will still make a respectable braising liquid for winter short-ribs, oxtails and pigs’ feet. *Why higher end wineries don’t just bottle their juice and sell it for cheap, I don’t know. Brand dilution, perhaps? P.S. Pssst! 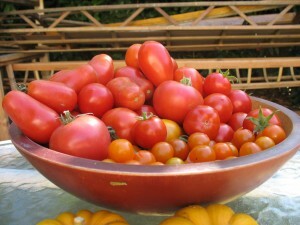 Look at this gorgeous bowl of tomatoes! Our bedraggled little plants have been cranking fruit out heroically since the first of July. Okay, couldn’t resist. Now pretend you didn’t see this.